The magnificence of Ancient Egypt is inviting you for a wonderful adventure at Vegas Spins with Scrolls of Ra Slot! A creation of iSoftbet, it is made of 5 reels and 20 paylines. You are greeted with a golden design and the beautiful interior of a temple. Find 2 pillars covered with hieroglyphs on each side of the reels. Different symbols can be seen on the reels such as the Sun, Raven, Sandstone Artefacts, Ankh, Kneeling Woman, A, K, Q, J, 9 and 10. A traditional Egyptian soundtrack also accompanies your gameplay. Launch this beautifully designed slot on any kind of device! Join the journey to Egypt on Scrolls of Ra Slot by picking your preferred coin value and Line Bet. Make use of the Bet Max button if you want to opt for the highest stake. Click on “Spin” once your bet is placed. Don’t miss the Auto Spin function which allows you to activate 5, 10, 15, 20, 25, 50, 75, 100, 200, 300, 400, 500, 750 or 1000 automatic rounds. Bet Levels: Choose 1 to 5 Line Bets. Amount of Paylines Selection: You can select 1 to 20 paylines for the game. Coin Values: Go for coin values ranging from £0.20 to £1.00. Want to discover the Ra Bonus Feature on Scrolls of Ra Slot? Simply land 3, 4 or 5 Ra symbols in any position on the reels to activate it. During this round, you are presented with 25 treasure boxes. Pick 3 of them and uncover cash prizes. Watch out for the Scrolls Bonus Feature! With the Scroll icon appearing on reels 1, 3 and 5, this feature is triggered. When it is active, 3 scrolls expand to fill up the reel. By selecting one of them, you can reveal a prize. Get the chance to earn up to 500x your stake! 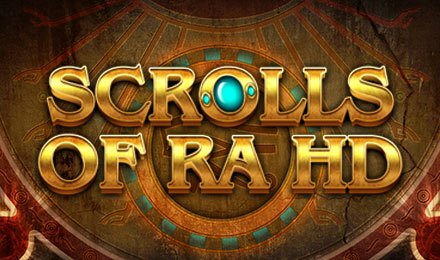 Look for the Scrolls of Ra Logo on Scrolls of Ra Slot! It represents Scatter and pays in any position on the reels. All your Scatter wins are multiplied by the line bet. Feel the authentic Egyptian atmosphere with the Eye of Horus symbol on Scrolls of Ra Slot! It stands for Wild and chips in for any symbol to create winning combos. It also helps to trigger the Free Spins round when it lands in the middle position on reels 2, 3 or 4. Also, it expands and fully covers the reel while remaining in place throughout the 5 free spins. During the round, both Ra Bonus and Scrolls Bonus features can be triggered. Let the sun god guide you to exciting rewards while you enjoy Scrolls of Ra Slot at Vegas Spins. Be ready for hours of entertainment and good luck!